Join us Easter Sunday morning for worship, Scripture, and baptisms! Sunrise Service at 7:15 will be a traditional service and an All Church with no kids’ programming so all are welcome to attend together in the Auditorium. Contemporary services at 8:30, 10:00 and 11:30 with great music, relevant teaching and incredible kids’ programs. 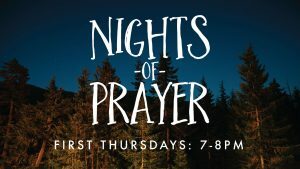 First Thursday Night of Prayer This is our monthly prayer meeting where we can come together as a church body and PRAY – Praise, Repent, Ask, and Yield up our lives to Him together!